A culture of recognition leads to people working together to achieve more. Employee recognition is a topic we’re very passionate about at Terryberry. 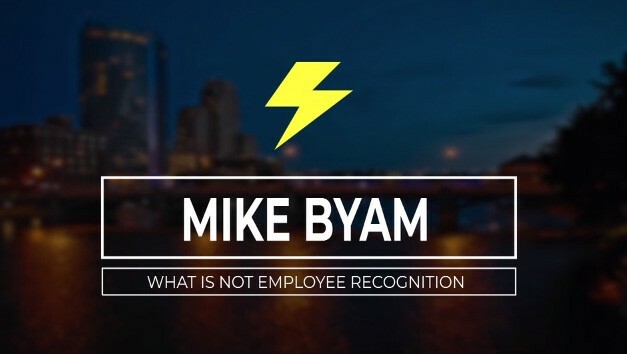 Catch the quick five-minute talk that Mike Byam, Terryberry’s Managing Partner gave on some common mistakes organizations make when it comes to recognizing their employees. DisruptHR is an information exchange designed to energize, inform and empower people in the HR field. Hosted by Keyser Insurance at the Waldren – a local Grand Rapids pub, the room was packed with enthusiastic HR professionals from West Michigan. Terryberry’s Managing Partner Mike Byam discusses “What is Not Employee Recognition”. Birthday Parties – it just doesn’t move the needle. Participation trophies – Yes it’s recognition, but it’s not unique and lacks meaningfulness. The Dundies Awards – This episode from The Office includes an award ceremony hosted by Dunder Mifflin Paper Company’s regional manager Michael Scott. In order to “maintain morale”, everybody gets a Dundie, which is mostly based on appearance. Instead – trying tying recognition to the goals and values of the company. Terryberry defines recognition as leveraging the attitudes, behaviors & contributions your organization values most that you’re trying to foster in your organization. Educate your leadership group on recognition. Make it easy! Have infrastructure in place. Implement systems and programs people understand and know they can patriciate in. Gauge results. Learn where the program is having an impact and who is having an impact. And ultimately address the folks that aren’t engaged with the program. Many organizations implement employee recognition programs in order to develop a culture where associates feel recognized and appreciated. For these programs to be successful, it’s vital that the company’s managers and leaders actively embrace them. Learn about sustainable employee recognition solutions from Terryberry designed to help your employees and your business thrive. Contact us today!